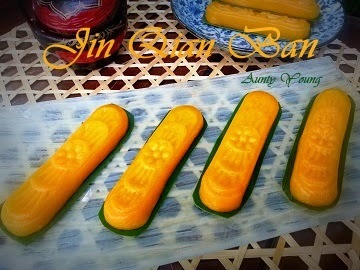 Jin Qian Ban is a type of Nyonya kuih. 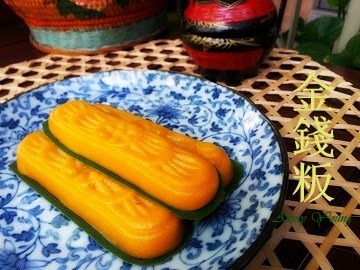 it is also known as Gold bar Ang Gu Kuih. is easier to eat compared with the traditional type. 1. Rinse mung beans several times till the water runs clear, then soak them in clean water for 2 hours. 2. Drain the mung beans and place them on a tray, then steam them over high flame for 30 minutes. 3. While the beans are still hot, place the beans, sugar and oil in a food processor and process till fine. 4. Set aside to cool. Shape into 13g small balls. 1. 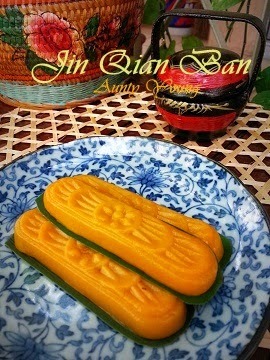 Steam pumpkin slices till soft (about 15 mins). 2. Using a fork, mash the cooked pumpkin and set aside to cool. 3. Add glutinous rice flour, rice flour, sugar and corn oil to the mashed pumpkin, slowly add in hot water and mix well till it becomes a soft dough, keep aside and rest 10 mins. 4. Shape into 20g small balls. ith glutinous rice flour for easy removal of the kuih later. 2. Flatten the pumpkin ball and place a mung bean ball on it. Wrap the pumpkin dough around the mung bean ball and shape into a round ball, then roll it into a log. 3. Place the log in the mould, flatten lightly, then knock it out of the mould (to prevent it from breaking when it falls onto the kitchen top, use your hand to hold it) and place the kuih on a greased banana leaf. 4. Arrange the kuih on a tray and steam for 5 minutes over low flame till cooked (do not steam over high flame to prevent it from changing shape). Once done, remove kuih from steamer and lightly brush the surface with corn oil. Note : For this recipe, you will have a remainder of 8 pcs of filling, thus you have to increase the amount of the dough by half. 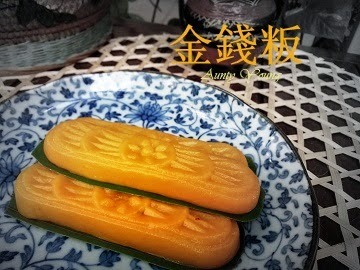 During the CNY, I had bookmarked this recipe when I saw it in Sonia's blog. Now that I've finally gotten round to using it, I'd like to thank Sonia for her selfless sharing. Hi Aunty Young, these gold bars are pretty and must be good too. Bookmarked to do as I have this mould. Oh, you finally did it, Thanks for your shout out. 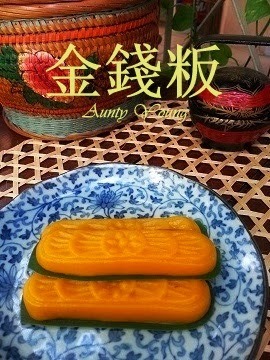 Aunty Young, I LOVE angku kuih! But so far only eaten the round ones.